Style and substance: can the two co-exist in a gentleman’s ski wear? The main objective for assembling an outfit for a day on the slopes is warmth. The basics of dressing for snowy conditions comes down to the layering of your clothes. 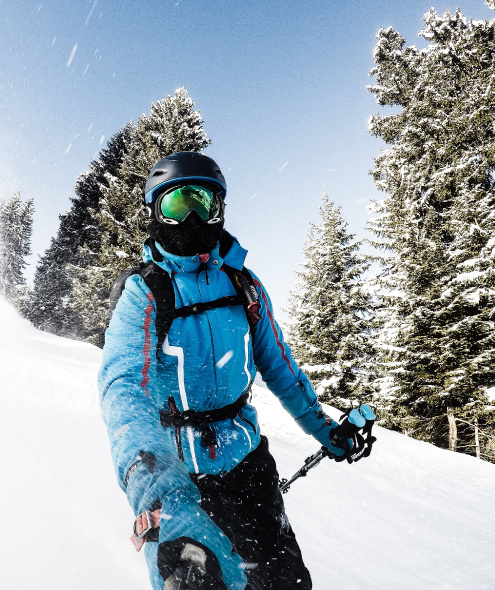 This starts with an all-important base layer, then building up layers of breathable clothes over this, before putting on a waterproof shell jacket. If you’re heading to the slopes for the first, or fortieth, time this winter – then MrQ’s guide to the ultimate gentleman’s ski outfit will provide you with everything you need to know, in order to hit the slopes in style. This layer is designed to sit directly in contact with your skin to release sweat and moisture created during skiing. The ideal garment for this layer needs to be lightweight, and be super soft against the skin – the last thing you need during a long day of activities is irritation. Cashmere is hygroscopic, meaning; it is naturally breathable. As the material is adept at wicking moisture away from your skin, it makes for the perfect garment to keep you cool when it’s hot, and warm when it’s not. More importantly, cashmere is extremely comfortable and stylish ideal for those long days on the slopes. MrQ recommends our cotton and cashmere Dean T-shirt. Tailored to fit impeccably, and knitted with the finest Mongolian cashmere. Once you have tried this on, no other T-shirt will be able to compare. It is essential that this layer keeps heat trapped close to your body. The ideal material for this layer is merino wool, due to its soft yet malliable qualitites. Wearing a mid layer that zips up and down allows you to easily cool down during the afternoon coffee. Then a quick and simple zip back up, when you need warmth again. MrQ recommends our super luxurious zip-up merino wool and highly luxurious cashmere jacket. This garment is versatile, easy to wear, and will enhance both your comfort and aesthetic style on the slopes. When the day is over, and it’s time for that long-awaited whiskey around the cabin fire – there’s no better way to wind down than being draped in a pure cashmere robe. Cashmere is a popular fabric for loungewear as it feels incredibly snug and soft against the skin. The material naturally stretches around your physique, meaning that you can easily move around after a tiring day skiing. Furthermore, cashmere is highly adaptable to various temperatures, due to the high moisture content of the wool, perfect for finding the right body temperature before a well earned rest. MrQ recommends our Stowe Robe, a luxurious garment that has been spun from the softest Mongolian Cashmere. An indulgent feeling that can only be experienced with 100% pure cashmere.